The Elder Scrolls Online Celebrates Its First Anniversary! Learn All About the New DLC Orsinium! Last month, Bethesda Softworks launched the latest Update 12 for The Elder Scrolls Online, which was One Tamriel. Additionally, Bethesda also launched a special contest, offering gamers a chance to enter to win some amazing once-in-a-lifetime trips to some exotic, real-life locations that inspired many of the realms and locations of Tamriel in The Elder Scrolls Online. This month, Bethesda celebrates the one-year anniversary of The Elder Scrolls Online, and that includes the launch of a new downloadable content pack for the game, which is called Orsinium. Additionally, there are also going to be some special one-year anniversary festivities for the game. The Orsinium DLC launched this week, and it celebrates the first year of The Elder Scrolls Online in style. The pack is included for players who already have an Elder Scrolls Online Plus membership. Otherwise, the DLC pack is available separately for 3,000 crowns at The Elder Scrolls Online Tamriel Unlimited Crown Store. Also, Bethesda is offering the standard Orsinium DLC pack and the Orsinium DLC Collector’s Bundle, also at the Crown Store. The Collector’s Bundle costs an extra 2,000 crowns at 5,000 crowns. This game pack adds a Cave Bear Mount, the Cave Bear Cub and five Crown Experience Scrolls. So you can enjoy Orsinium in style while riding around a giant bear like a boss. On top of that, players can get the Collector’s Bundle at a nice discounted rate throughout this month to mark the anniversary. Overall, there’s some really juicy rewards here for players to take advantage of in The Elder Scrolls Online this month, so it definitely seems like a good time to get back into the game to take advantage of the double rewards, along with the double items from crafting nodes. In Orisinium, players will find new plots and counter-plots to explore and discover in the wintry, mountainous area of Wrothgar. The DLC includes new enemies and allies for players to encounter. For players who need some additional help with getting the basics and bearings down for the Orinisum DLC, Bethesda has also supplied some helpful guides to help them navigate through the new content. You can check out guides for The Basics, The Areas and The Maelstrom Arena. 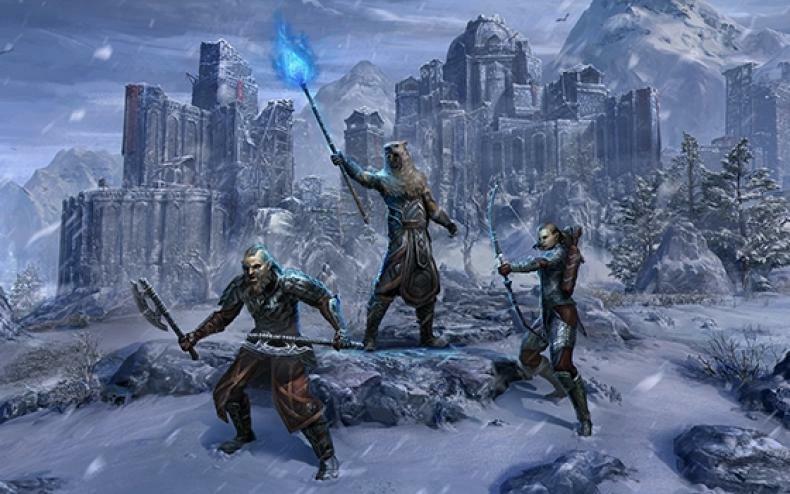 The Orsinium DLC takes players to the wintry Wrothgarian Mountains. There, the Orc leader King Kurog is looking for adventurers to help him in a quest to rebuild the Orcish capital, the city of Orsinium. Orsinium features a fairly robust package of new activities, adventures and even new boss enemies to fight. The main plot for Orsinium is the task to “Rebuild Orsinium” and to unite the other Orc Tribes. This task includes a number of new quests to help bring the city back for its former glory. The DLC also features two new huge public dungeons. The first one is Old Orsinium, a crumbling abandoned old city and the first, ancient location of the Orc capital city that was previously destroyed in the First Era. The Old Orsinium dungeon has three legendary gates: Smelter; Hammer; and Temper. The dungeon features the Caves of Dark Abundance, where players can locate the sacred fire of Malacath in the Temple of Grudgement. The second new dungeon is Rkindaleft. This is a Dwarven ruin that’s trapped in a glacier that has been a subject of long-held rumors and tales used to frighten Orc children. The massive new zone of Wrothgar in the DLC has many points of interest where players can discover new delves, undiscovered skyshards and more. Another new feature are the six new World Bosses who are located throughout the zone, who players can challenge. Another fun new element is the Maelstrom Arena, which is a single-player progressive challenge arena. Here, players can face fierce enemies and fight for their life. The Maelstrom Arena enables players to earn prestige and climb through the game’s leaderboard rankings, along with earning rewards in the form of powerful, new weapons. The Maelstrom Arena has nine combat rings and two levels of difficulty: Normal and Veteran modes. The rewards for the arena are available only by completing the arenas. To add a greater level of depth, the Maelstrom Arena offers class-specific leaderboards. The Elder Scrolls Online anniversary event will be running through Monday, November 21 at 10:00 am EST. There’s also a new Orsinium DLC trailer, showing some of the breathtaking locations of the realm, along with the awesome bear mounts. The anniversary festivities are up now for the game on all platforms. Gamers who are interested can still enter The Elder Scrolls Online Trip of a Lifetime Contest. The online Entry Form is still live, and gamers and fans can register for the contest from now until December 16, 2016. Players can also enter to win via mail as long as their entry is postmarked no later than December 16 and received by January 6, 2017. Fans of The Elder Scrolls can enter to win one of five possible trips to five exotic locations around the world that inspired actual places in the world of The Elder Scrolls. The Elsweyr Package takes the winners on a trip to an African Safari. The Skyrim Package is a visit to the Swiss Alps. The Black Marsh Package goes to the Amazon and Machu Picchu. The Hammerfell Package is in Morocco. And finally, the Summerset Isles Package is in New Zealand.